It’s time to warm up to one delicious new IsaLean® Shake—Black Sesame! 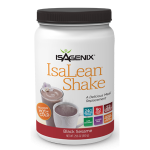 Featuring the same high-quality undenatured whey protein you’ve always enjoyed, this IsaLean Shake includes one special feature: you can warm it up! Savory in flavor and ideal for all seasons, it’s perfect on a chilly day or for those moments when you wake up and just want to switch it up! 3) Whisk in two scoops of Black Sesame IsaLean Shake mix and enjoy! Black Sesame IsaLean Shake is an Asian-inspired taste that’s appealing to a wide variety of palates. And, just like our French Vanilla and Dutch Chocolate flavors, it also supports lean muscle growth and maintenance, burns fat and boosts metabolism, increases your energy and recovery and guards against oxidative stress.